Ezine Act 52! How to Use Business, Love and Politics to Do What You Love? The Ezine Act 52 explores the tragicomedy of the religious military dictatorial regime of Sudan in Darfur in the editorial and the political sections. In the business and love sections, it shows you how to choose your theme. In addition, the newsletter makes love sessional with special art essence to inspire you in the sentimental section and highlights proven business methods to use what you love to do to improve your life through an online strong business presence. You will need that essence of art to make the combination of what you love to do something worth your efforts and brainstorm your mind to come up with a theme that interests you and some other people, so you could build a brand out of it. Historical Lights on the Ezine Acts Newsletters! You'll read the Ezine Act 52 in a moment, just below this column I added to the newsletter later. Before reading the Ezine Act 52, you should know the historical backgrounds of the our newsletters, including the Biz Marketing Newsletter and the Ezine Act Newsletter, as they have been developed and changed between many websites. So, this is actually, an introductory, I added after almost 12 years to this edition of the Ezine Act 52. I started the Ezine Act newsletter on a website I had before at child-book-publishing-ezine.com. I deleted that website because of some reasons and the issues of the Ezine Act Newsletter from 1 to 49 have gone with it. However, I had them stored in a computer somewhere, so I could use them later. I added the Ezine Act Newsletter to this website to be the second newsletter on this network. I published many editions of the political newsletter from the issue 50 to the issue 65 on this network and then decided to take it to a new website I created at HOA Political Scene and therefore, renamed it HOA Political Scene Newsletter. The Wise Biz Marketing Newsletter was started on another website too at wise-biz.com and I published the issues of the Wise Biz Newsletter starting from the issue 1 to 35 on that website. When I discovered that the website was serving another company, I closed it and shifted to the Ezine Act's website to publish the WBM Newsletter from the issue 36 until the issue 74. So, we have many editions of the Ezine Act Newsletters and the Wise Biz Newsletters on this network. However, I again decided to close the business newsletter and build another website to carry on with a new topic. I did that because of two facts. First, I found the Ezine Act website very broad (ss you could see from the long url) and discovered that I will not build a real business unless I build what I love to do in a narrow niche. I actually have learned this through years of experimenting and trying to focus on a specific topic to build a theme focused website, instead of building broad websites. So, the lessons to take from the historical backgrounds of the newsletter are clear that you'll never build anything you love to do unless you decide to focus on one topic you know, whether it is your hobby, professional and personal experiences, something that you have passion for, or things that interest you to come up with a narrow niche. At this point, however, some columns of the Biz Marketing Newsletter highlight the most things you should do to focus on a topic and build it a brand. Now here is the Ezine Act 52, as I published it the first time with the publishing date included on the header of the edition. "Highlighting the Combination of Politics, Business and Love". In This Issue of the Ezine Act 52! Introduction: About our Newsletters and our New Website. Politics: Editorial: The Dictatorship Crimes Are Not Ethnical Cleansing - 2! And Love: Real Love - What's it! The Ezine Act 52nd Introduction! Welcome back everybody and a warm welcome to our new newsletters subscribers and occasional visitors. Your Ezine Act 52 is now back on its own web site. We host it before at our child book publishing ezine. Since you knew from the email updates about our future plans, so you'll be able to read the Ezine Act 52 and other editions we published previously here. Many thanks go to those of you who accepted our call to subscribe the business newsletter on this website. I hope that you have received your gifts from the subscription confirmation page and enjoyed it and learned how to use things that you love to do to improve your lives. This is a 100% FREE Newsletter… Donation and a portion of any paid ads on the Ezine Act will easily be made to children charities. There are many children who are living in misery you know. We should concentrate our efforts on the future generation although we are doing other kind of businesses. We have changed the (Guest Dewy Corner) and from now forth you're going to read news and some issues (Behind the Misery Margin). We think this is good to follow up news in other miserable parts of this world. You'll be able to see behind the misery margins and know something about those dictators who are ruling their people by iron and fire. The political column in the editorial section continues from the same column published on the Ezine Act 51. So, you may need to read that edition to connect with this one. The next column, Behind the Misery Margin is about the USA Resolution for the devastated region of Darfur in the devastated country of Sudan, followed by the business and sentimental columns. The Political Column of the Ezine Act 52! Editorial: The Dictatorship Crimes Are Not Ethnical Cleansing - 2! Read the first article under this title on the Ezine Act 51 and then continue here on the Ezine Act 52. The BBC said last week the UN Security Council has warned the Sudan government that it must halt atrocities by Arab militias in the western Darfur region within 30 days. The question is: Why the BBC calls those militias an Arab militias and not Janjaweed or just Sudanese militias? The fact is that there're no Arabs in the Darfur conflict. Those who are called Arabs are Sudanese. And from it's name in which Sudan means the Black, if you see this million squire miles wide land in the Horn of Africa you can not classify Sudan as an Arabic state. No it's not. It's neither an African nor an Arabic land. It's a mixture of those two origins which created the recent Sudan. So, more than 95% of the residents in Sudan are Sudanese not pure Arabs. It's not necessary if some people there are called Ali, Musa or Aisa and if they speak Arabic, to say that they're Arabs. You can find those Arabic names in Nigeria for example, so is that an indication to classify Nigeria as an Arabic state? Sudan has guaranteed its hospitality to numbers of communities when they came from some parts of Africa to reside on it's land a long time ago; and those communities became Sudanese gradually generation after generation. The first Arabs migrants to the north of Sudan had resettled and integrated with the residents through history to create Afro-Arabic generations from that integration and small community of them had resettled on the upper northeast of Sudan and isolated itself from the integration. Some people in Sudan call sometimes other people as Arabs not as a matter of classification and not as a matter of discrimination. That happens even amongst brothers from the same family who are speaking Arabic. The same thing happens when somebody calls another "ya abid" which means "slave". For example, there are some dark color / black people in some families in the north of Sudan and you can hear their brothers calling them by such description. Those Arabic speakers in Darfur or elsewhere in Sudan are not pure Arabs although they can believe themselves they are. I do not think the language only is the best classification to define the tribal ethnicity. Clans history in Sudan says something about the old migrations from the Arabic and African surroundings. The recent Sudan was formed when the migrants and the old residents integrated in peace through years. We say what happens in Sudan now is not like what the BBC or other media sources say to impose this picture in the public opinion. The political deterioration is the severe outcome of three military dictatorships and three civil sectarian dictatorships. Read more about this at the political site linked above. And let's call to submit all of those dictators and rebel's leaders to the International Criminal Court ICC! Please use any method to support the Ezine Act in this issue. Go to Amnesty International and even to the International Criminal Court and submit your support to the Sudanese people against those terrorists. Read the rest of the news on the spot. Yours in Peace,,Love and Global Prosperity. Publisher and Senior Editor of the Ezine Act 52. Khalid Osman is journalist, writer, poet and teacher. He wrought in Sudan, Iraq, Kuwait and Eritrea in his profession as journalist and teacher for more than 30 years. As freelancer, he contributed in many newspapers and magazines published in London, Paris, Cyprus, Baghdad, Kuwait, Amman and Beirut. He was an activist in those fields: Environment, Press, Education, Human rights, Children and Women. Ezine Act 52 Behind the Misery Margin! The U.S.A Drafted Resolution on Darfur! The Military Religious Regimein Sudan rejected the resolution, saying it conflicted with existing agreements with the UN. The resolution has been criticized as a "failure" by one major aid agency. The only thing the UN Security Council has delivered is... another 30 days in which civilians will continue to live in fear of being killed or raped. The US Ambassador John Danforth told the Council after the vote: "The government of Sudan has left us no choice. It has done the unthinkable, it has fostered an armed attack on its own civilian population, it has created a humanitarian disaster. 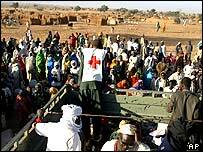 Darfur has been described as the world's worst humanitarian crisis. Aid agencies, meanwhile, charge that the resolution has been fatally weakened by the changes. "The Security Council has today proved unanimous in their inaction," the representative of one major aid agency working in Darfur, which wanted to remain anonymous, told BBC News Online. Meanwhile, the World Food Program has said it will begin a series of airdrops targeting 85,000 people in isolated regions of West Darfur in three days. When you finish reading, close the window to continue here on the Ezine Act 52. The Ezine Act 52nd Financial Column! As I mentioned about wide concepts websites above, the Ezine Act 52nd financial section takes it further to assure you that internet business success is in narrow niches. Every narrow niche should be about one topic you know and you love to do to build it focused on one theme, as you learn from the Ezine Act 52. But, even if you don't have the required information to build a theme focused website, you can learn that from the only tools in the world combined in one place to learn about the things you love to do and be professional to choose one of them based on values to build it, as you learn from the Ezine Act 52. You generate income from it according to the values the theme has. And, here exactly, is where the tools come to provide you with solid data about the profitability of your theme. Through more than 10 years, I have not been able to find tools like those I love and a "proof of results" page like this one anywhere on the net. Make sure to know them through the Ezine Act 52. I bet you can't either. And neither will your audience. It is not only the proof, but come and compare any business to this one to see the differences. The tools I refer to, include the manual and the manual itself is another story, you'll never find in any place else. The best of it is that it first helps you discover the best of the things you love to do based on the values each of them has. The values are based on the demands. The demands could give the angle you want to approach this concept and build it on many pages, each of which generates income based on these values, as you learn from the Ezine Act 52. All the operation has methods. All the methods has ingredients of optimization and monetization to the theme focused content website, as you could learn from the search engines section on the Biz Marketing 36, Biz Marketing 37, Biz Marketing 38 and Biz Marketing 39. Then the tools teach you how to build it the best way you can guided by the CTPM process, which is the mantra of the manual, as you learn from the Ezine Act 52. We call them SBI in abbreviation, referring to Site Build It, where you can read more about SBI and even start learning from free resources and attend the business e-learning college through many of the free offers SBI offers supported by the SBI Affiliate Forums, when you become an affiliate. For more information about affiliates you could use in your theme focused website, read the Ezine Acts Affiliate Programs and the Ezine Act Associate Programs. It is that glimpse of hope that endures when we find ourselves in the tight dark funnel some wretched dictators create to make the wretch of earth possible. When they claim by religious beliefs that love is forbidden and any couples found in such position would be stoned to death, lovers should revolt and bring them down, because the state is a secular concept and it should be free and modern state. I maybe very sentimental, because I always create my beautiful romantic corner in this world doing my dreams alone each time that I have an out door confrontation with politics. For along time, I made my own creative remedy to cure my soul from the infection of the dictatorship and terrorism, which are more infected than the binary deadly malaria and bilharzia, that are killing hundred thousands of people there in my home land and the other regions in Mama Africa. More Love Doses are at the Ezine Acts Love Commentaries, Ezine Acts Love entries, Ezine Acts Love Stories, Ezine Acts Sentimental Stories, Love and Romance, Love Consulting Services, Polite Touches and Problems Management. Well, here we are now at the close of our Ezine Act 52. We hope it's interesting. * Please share the Ezine Act, Politics, Business and Love with your social media, or forward the Ezine Act Blog to your friends, or pin one of the Ezine Acts Pictures on this page, or at the Ezine Acts Galleries, Ezine Acts Photo Gallery and Pictures for Your Website. Thanks.